I'm building 1303 Bug that is in an awful condition. The rear brakes made from a parts of a "Zhiguli "-Soviet car that is very common in my country. So i need it and rear brakes "adjuster" and everything except what i can buy new: brake shoes, wheel cylinder and spring kit. Please help, because i can't find these parts in my country, there is absolutely no Bugs in a junkyards. Last edited by Mixagolf1 : 06-02-2010 at 21:07. Are the brakes ' self-adjusters' (with a wedge adjuster) or do they have the toothed-ring adjuster? No self-adjusters, and as i remember my Golf 1 it had another drums. 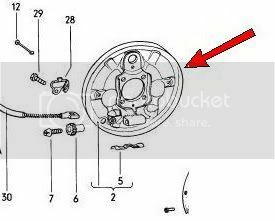 The rear brakes of a 1303 are the same as those from 'any' bug. nGolf items are completely different. Do you need the drums itself as well? Since they're quite heavy.. I think I have a set of backing plates laying around. But I'm not sure, since I've thrown away some things since I got irritated of those parts laying around that I don't use anyway.... I'll take a look this weekend! I have another set of drums, hope they are better then those on a car. Will be great if you find some parts for me. Any idea what can be a cost of parts and a shipping cost? Thank you! Hey guys you are lucky there! thanks for the replies, i bought both backing plates off eBay yesterday.